This humorous wall-hanging brings an angelic touch to any home at Christmas! 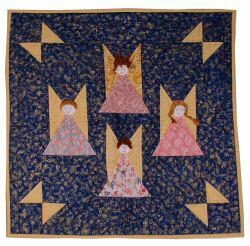 Hand pieced, each angel has it's own individual dress and hand-sewn 'hairstyle'! Hand and machine quilted. Because of the delicate nature of some of the fabrics used, it is recommended that this banner is dry cleaned only. If you would like to buy this item, please contact Pat or send Pat an email by clicking here. This item is not available in stock, but would be made up to order. Orders take about one month, depending on demand.